Give up to life your every action, your every ounce of faith. Throw all your best energies, sincerely and disinterestedly, into life. Immerse yourselves, living creatures that you are, in the live, pulsing tide of human existence, until you feel at one with it, until it floods through you, and you feel your individual personality as an atom within a body, a vibrating particle within a whole, a violin string which receives and echoes all the symphonies of history; of that history which, in this way, you are helping to create. In spite of this utter abandonment of the self to the reality which surrounds it, in spite of this attempt to key your individuality into the complex play of universal causes and effects, you may still, suddenly, feel a sense that something is missing; you may become conscious of vague and indefinable needs, those needs which Schopenhauer termed metaphysical. You are in the world, but you do not know why you are here. You act, but you do not know why. You are conscious of voids in your life; you desire some justification of your being, of your actions; and it seems to you that human reasons alone do not suffice. Tracing the causal links further and further back, you arrive at a point where, to co-ordinate, to regulate the movement, some supreme reason is necessary, some reason which lies beyond what is known and what is knowable. You are just like a man looking at the sky, who, as he moves further and further back through the space while science has mapped out for us, finds ever greater difficulties in his fantastic uncontrolled impulses. But what can conquer them is the force of life itself; historical activity can annul them. They are simply the products of tradition, the instinctual vestiges of millennia of terror and of ignorance of the reality that surrounds us. Their origin can be traced. To explain them is to overcome them. To make them the object of history is to recognize their emptiness. And then one can return to the active life, and experience more authentically the reality of history. By bringing feeling, as well as fact, within the sphere of history, one can finally recognize that it is in history alone that the explanation of our existence lies. What can be historicized cannot be supernatural in origin, the vestige of some divine revelation. If something still remains inexplicable, that is due only to our cognitive deficiencies, to the still imperfect grasp of our intellect. Recognizing this may make us more humble, more modest, but it will not throw us into the arms of religion. Our religion becomes, once again, history. Our faith becomes, once again, man, and man’s will and his capacity for action. We feel an enormous, an irresistible, force from our human past. We recognize the good things it brings us, like the energetic certainty that what has been possible will be possible again; all the more so, in that we have become wise through the experience of others. But we also recognize the bad, like these inorganic vestiges of transcended states of mind. And this is why we inevitably feel ourselves to be in conflict with Catholicism; and this is why we call ourselves modern. Because, though we feel the past fuelling our struggle, it is a past that we have tamed; our servant, not our master; a past which illuminates and does not overshadow us. From Pre-Prison Writings, edited by Richard Bellamy. Cambridge Texts in the History of Political Thought, 1994, pp 13-14. 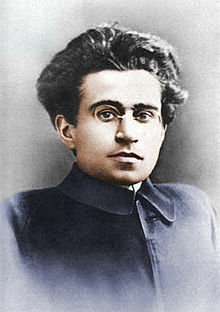 This entry was posted in history, philosophy, politics, writing and tagged atheism, gramsci, historical materialism, humanism. Bookmark the permalink.